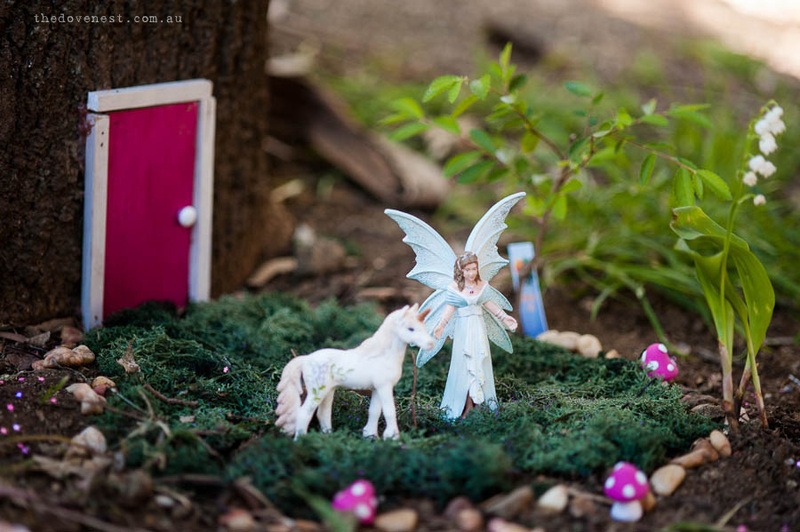 fairies at the bottom of the garden. With just a small camping lantern lighting the area, I hammered, as quietly as one can, trying to get the small piece of timber to attach to the tree. The first went on ok. The second piece, the nails kept bending. Then I walloped my finger with the hammer. Mr Dove came to see what all the commotion was about, and nursing a sore thumb I shifted over in a huff and let him at it with some adhesive. The main pieces in place, I quickly dug a couple of quick holes, added plants and got busy decorating. The next morning, our newly minted four year old excitedly ripped open her presents – fairies, fairies everywhere. A Rainbow Fairy. A Queen Fairy with a lectern to govern her subjects from. A Mama Fairy with a Baby Fairy. A unicorn. With the dew still on the ground and the jammies still on the girl, I scooped her up into my arms, holding her close as her arms wound around my neck and she snuggled in to me. Together, we crept up to the back of the yard, to a little dead spot between a tree and the cubby house, a trail of brothers and daddy behind us, as if we were the Pied Piper – if the pied piper wore kitty cat pjs and talked constantly instead of playing a pipe. The moment she saw it, she squealed (in my ear. Thanks Butterfly, mama didn’t need to hear), and squirmed until I let her down. The second she had breakfast, she was back out the door again – at least until I insisted she get dressed, which involved the bare minimum amount of clothes she could a) find close by and b)mama would let her out the door wearing. Then Nanny & Poppy turned up with a skirt fit for a fairy princess, and she was in girly girl heaven. 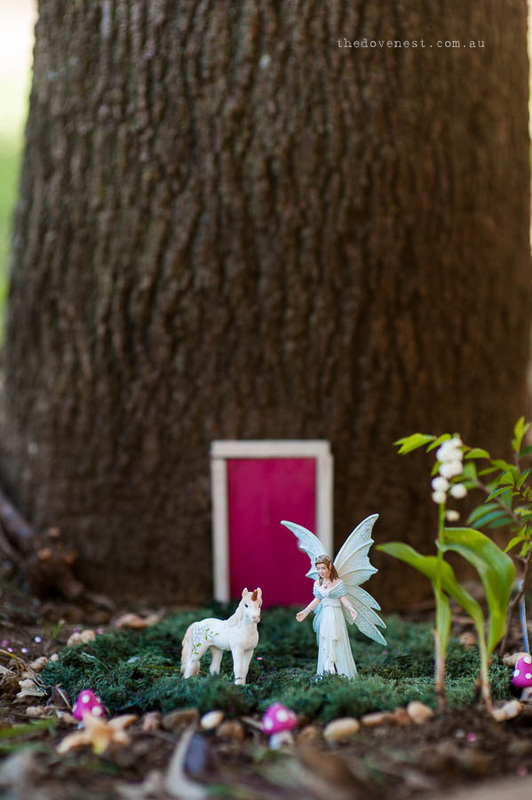 Our fairy garden was made from a “door” of 3mm ply with some 6mm quad as a frame & a button hot-glued on as a door handle. Garden pebbles made the fairy ring, a Lily of the Valley & bonsai Chinese Elm added some greenery, the hot pink mushrooms I made myself from Fimo, and the ground cover I bought from the model train section of the hobby shop, after a failed attempt to buy potted moss (actual real moss is still on my list to organise). I also hope to add some pearsl or rhinestones to the door frame, and maybe add a mailbox. 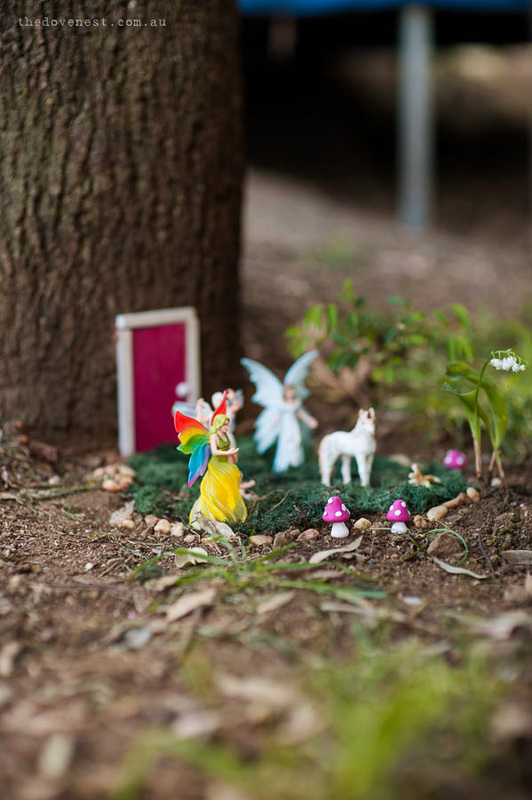 For now, though, Miss Butterfly is totally blissed out on her fairy garden. Happiest of happy birthday my fierce fairy queen. 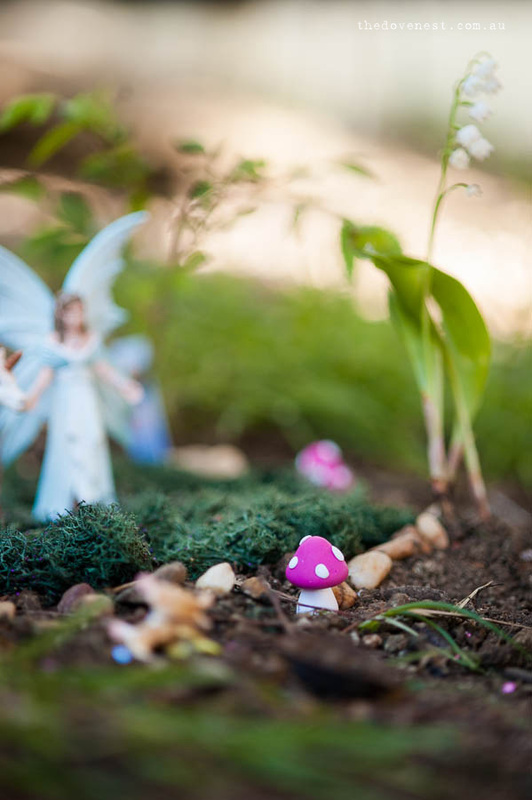 May you always believe in fairies at the bottom of the garden, and may your life be forever filled with magical moments. That is such an awesome gift to receive! The girl was suitably impressed and has spent many happy hours playing in it. And it’s nice to give something that doesn’t involve more clutter in the house! That they are! Even stubborn little misses who run rings around their big brothers!